Gathering in Stevens Point, Wis., June 24–26 to celebrate the convention theme, “Bouquet of Blessings,” from Psalm 103:2, Bless the Lord, O my soul, and forget not all his benefits, were 396 women and men of the LWML North Wisconsin District (NWD). Rev. Andy Weden and students of Peace Lutheran Student Fellowship hosted an open house Sunday afternoon on their campus. Gifts of the Heart were donated for the Peace Lutheran Campus Ministry to further their ministry. Following the Sunday evening Divine Worship Service, LWML NWD President Mary Harrington welcomed attendees to a reception. Past and future mission experiences, both here and abroad, were shared by speakers Rev. Andy Weden, Rev. Dr. Robert and Kristi Roegner of Apple of His Eye Mission Society, Wendysue Fluegge who also served as worship song leader, Karen Carter of Bethesda Lutheran Communities, and missionaries to Kyrgyzstan Rev. Bob and Sue Pfeil. LWML President Patti Ross brought greetings to the convention attendees. 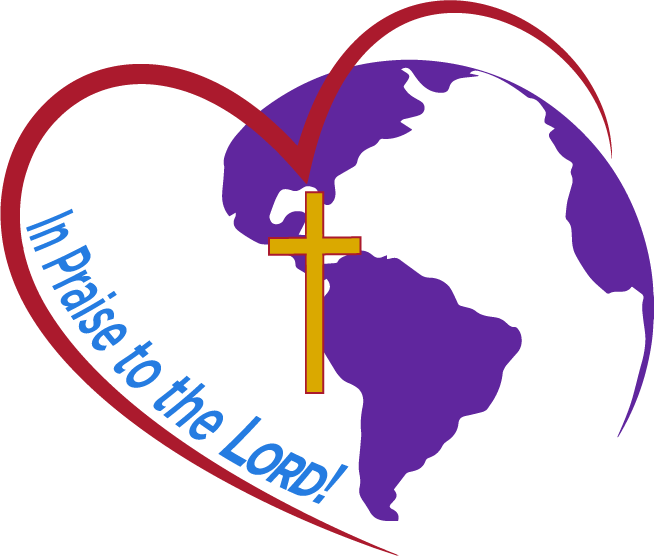 Patti was uplifted by the enthusiastic Lutheran Women in Mission of the LWML NWD. A bouquet of blessings mite walk was held; followed by a 75th anniversary banquet where the 1944 vintage-dressed attendees were entertained by the Benson Family Singers. Michelle DeRusha led the Bible study. Keynote speaker Jan Struck compared the LWML to the early Christians in the book of Acts. Servant events included cutting and rolling bandages for Global Health Ministries, making witness bracelets for MOST Ministries, preparing LWR school kit backpacks for Orphan Grain Train, and preparing personal kits for Shirley’s House of Hope. Becky Haltaufderheid, Algoma, WI was installed as the new LWML NWD President. Nearly 380 Lutheran Women in Mission gathered at Camp Okoboji, outside of Milford, Iowa, June 28–30. Convention theme, “On Christ the Solid Rock I Stand,” was based on Matthew 7:24 Everyone then who hears these words of mine and does them will be like a wise man who built his house on the rock. 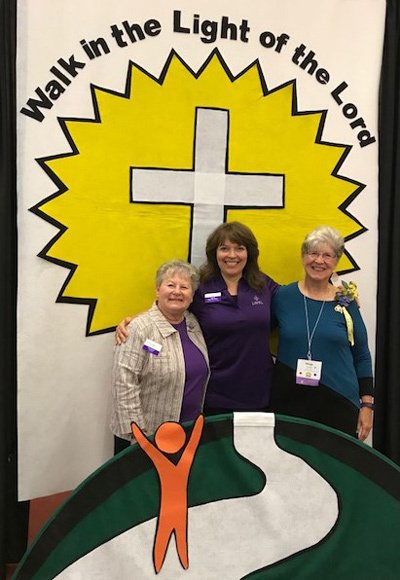 LWML IWD President Ann Carrick presided over the convention business which included voting for officers and approving a $210,000 Mission Goal to fund 11 district mission grants and national LWML grants. Attendees were encouraged to bring Saved to Serve ingathering items of one new bra, washcloths, travel-size toiletries, or $5 McDonalds gift cards to be included in Thank You cards for veterans which were made in the servant activities. Two other servant activities were assembling Bible based coloring books and knitting/crocheting 8” x 8” squares for miscarriage packages. LCMS Iowa West District President Rev. Dr. Steve Turner served as Proclaimer at the Thursday Worship Service; Past LWML President Jan Wendorf led a rock solid Bible study; Rev. Dr. Brent Smith gave the keynote address; and Wendysue Fluegge was the convention’s “rockin” song leader. Three rooms of the Christian Life Center were filled with displays and exhibitors. LWML Vice President of Christian Life Jennifer Huecker brought greetings from LWML and commented that she thoroughly enjoyed participating in the convention and thought that the inaugural “pound” silent auction for mites was fun and successful. Jennifer said that for the auction, participants were asked to bring an item weighing a pound, wrapped so that it was unidentifiable, yet clues were given as to its contents. 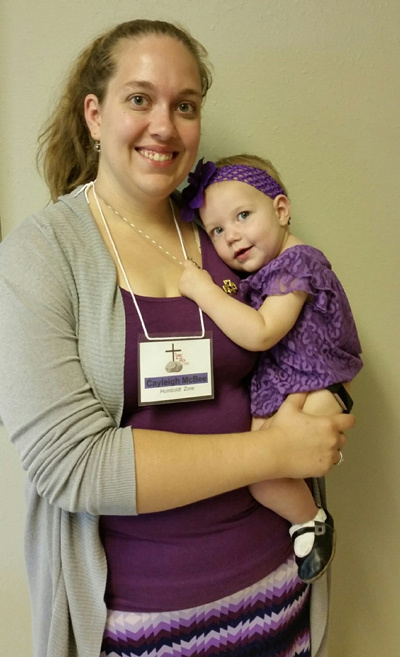 Jane Morris, a former district YWR, was elected president of the LWML Iowa West District. Following the closing memorial service, newly elected officers were installed. The Verizon Center in Mankato, Minn. served as the convention site for the June 29–30, 2018 LWML Minnesota South District (MSD) Convention. 1 Corinthians 15:10a, But by the grace of God I am what I am, and his grace toward me was not in vain, was the basis for the theme, “Grace Above All.” Pre-convention events included a Mite Mission Walk, Servant Event of creating cards for military veterans, and a First-Timers Event held on Thursday evening. A silent auction, of 76 grace-filled baskets, brought in $3,675 for mission grants. LWML MSD Counselors led Christian Life Bible studies on water, word, and table of grace. Rev. Dr. Gary Zieroth, assistant professor of Pastoral Ministry and Missions, dean of Students and director of Vicarage at Concordia Theological Seminary Ft. Wayne energized the attendees as convention Bible study leader. Inspiring mission speakers were Rev. Ben Griffin, Executive Director of LINC Twin Cities and Rev. Ryan McDermott, Area Facilitator for Deaf Ministry-West and Central Africa. LWML Senior Pastoral Counselor Rev. Robert Mundahl served as Proclaimer at the Friday evening Worship Service. LWML Public Relations Director Michelle Zollinger brought greetings from the LWML and commented that God’s grace was evident and exuding in the gifts and hearts of the 325 Lutheran Women in Mission of the LWML Minnesota South District. LWML MSD President Margaret Hesemann conducted the business of the district that included approving a $285,000 2018–2020 Mission Goal with 13 mission grants selected, updating bylaws, and electing officers. Following the installation of officers, the convention was adjourned by newly elected president of the LWML MSD Debra Vinkemeier. The campus of Valparaiso University, Valparaiso, Ind. 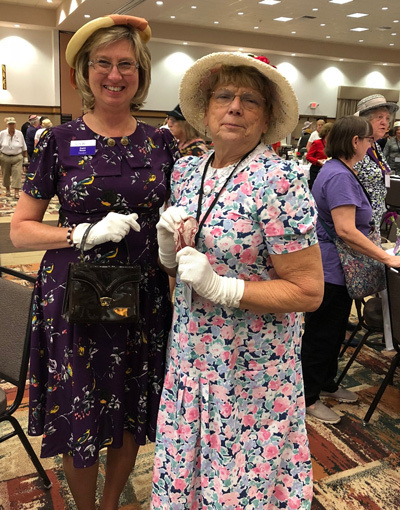 was the location for almost 350 people attending the 27th Biennial LWML Indiana District Convention, June 29–July 1, 2018. The convention theme, “Walk in the Light of the Lord,” was based on the convention Bible verse, Isaiah 2:5–6 O house of Jacob, come, let us walk in the light of the LORD. For you have rejected your people, the house of Jacob, because they are full of things from the east and of fortune-tellers like the Philistines, and they strike hands with the children of foreigners. Servant activities were filled on Friday with laughter and busy hands making Cards of Hope and children’s fleece blankets for Phil’s Friends; preparing convention welcome bags; and trimming/sorting stamps for mites. The campus Chapel was the site of the Friday evening opening Worship Service. LWML Indiana District President Emily Rogers presided over the convention business including the approval of 16 Mission Grants totaling $122,000 and the election of officers for the next biennium. Marge Gruber was elected new LWML Indiana District President. LWML learning opportunities at the Saturday luncheons were provided by district committees of Christian Life, Christian Outreach (with Kristi Roegner who spoke about “Sharing God’s Light”), Human Care, Leader Development, Heart to Heart Sisters, Mission Grants, and Young Woman Representative (with LWML Strategic Plan Facilitator Carol von Soosten, who spoke about the past and present of the YWR program.) 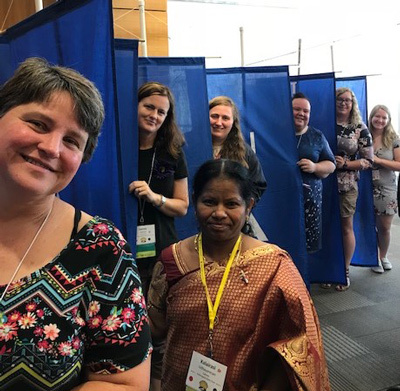 Carol, who served as the LWML representative and brought greetings to the convention assembly, commented, “These brothers and sisters in Indiana are walking in the light of the Lord! May God continue to urge them to be beacons in the middle of darkness.” More lights were shining during the Saturday afternoon interest sessions by Rev. Delwyn Campbell — Serving the Lord in Gary, IN, Rebecca Masters and Jan Roth — Japan Short Term Mission Trip, Dr. Jon Eifert — The Hymnal in Your Home, Rev. Joseph Cunningham — Chapel of the Resurrection Windows, Tim Hetzner — K-9 Ministries, Rev. Jon Albers — Serving Re-Imagined, and Rev. Dr. Robert Roegner and Kristi — What Do Jewish People Think of Jesus? 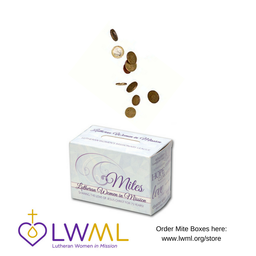 You and your congregation help support LWML grants through individual Mite Box offerings to local societies, zones, and districts, the LWML website’s online donation process, setting up recurring electronic donations through Joyful Response®, by calling the LWML office — 1.800.252.5965, or mailing your contribution to: LWML, 3558 S. Jefferson Ave., St. Louis, MO, 63118. Visit lwml.org/2019-convention to order your 2019 LWML Convention shirt. Proceeds from 2019 LWML Convention shirt sales will help defray expenses of the Convention Host Committee’s activities.